↑ "Sir Alexander Chapman Ferguson". mufcinfo.com. Retrieved 12 July 2011. ↑ Hunter, James (24 December 2010). "Steve Bruce: Sir Alex is the best manager ever". Newcastle Chronicle. Retrieved 18 October 2015. ↑ Hayward, Paul (5 November 2011). "Sir Alex Ferguson's adaptability has made him the greatest of all time". The Guardian. Retrieved 9 November 2015. ↑ Macintosh, Iain (9 August 2013). "Greatest Managers, No. 1: Ferguson". www.espnfc.us. Retrieved 9 November 2015. ↑ "Sir Alex's crowning glory". BBC News. 20 July 1999. Retrieved 6 November 2012. ↑ Barratt, Nick (5 May 2007). "Family detective". The Telegraph. London. Retrieved 30 October 2009. ↑ Barratt, Nick (5 November 2010). "Alex Ferguson profile". Soccer-Magazine.com. Archived from the original on 16 June 2011. Retrieved 12 July 2011. ↑ "Sir Alex Ferguson tribute to Drumchapel Amateurs' legend". Evening Times. Glasgow. Retrieved 19 January 2018. ↑ "Glasgow Caledonian University, Research Collections, Archives". TheGlasgowStory.com. 2009. Archived from the original on 3 July 2011. Retrieved 12 July 2011. ↑ "Man Utd rename Old Trafford stand in Ferguson's honour". BBC News. BBC. 5 November 2011. Retrieved 5 November 2011. ↑ "League Managers Association 2011–12" (PDF). League Managers Association. 2011. p. 12. Archived from the original (PDF) on 26 January 2012. Retrieved 12 July 2011. ↑ "Sir Alex Ferguson Trophies". Manchester United F.C. Retrieved 7 July 2011. 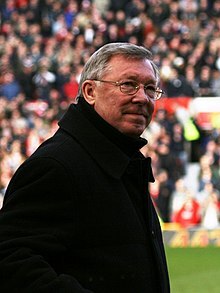 ↑ "Alex Ferguson". Post War English & Scottish Football League A - Z Player's Transfer Database. Retrieved 19 January 2018.